What's bigger than the biggest action movie explosion of all time? The next explosion. The 24th James Bond movie currently holds the Guinness World Record for "Largest film stunt explosion." The destruction of Ernst Stavro Blofeld's Morroccan communications center requried 8,140 litres of kerosene, 24 one kilogram explosive devices, a ton of dust and debris pieces, and 300 detonators. The spectacular stunt was staged by prolific Bond special effects supervisor Chris Corbould (he's been the SFX supervisor on all the 007 films since GoldenEye) and explosives expert Charles Adcock. The scene wasn't just one giant boom; the non-stop arc of fireballs that consume Blofeld's buildings meant the explosion had to be programmed, using specialized computer chipped detonators, timed to blow in the middle of a line of dialogue between Bond (Daniel Craig) and his newfound friend Dr. Madeline Swann (Lea Seydoux), who stood a quarter of a mile away from the blast site. A three-second delay built into the explosion rig made timing even more difficult. But after several rehearsals, the stunt went off perfectly and only required enhancement with computer generated (CG) imagery by Industrial Light & Magic for a few lair buildings and some additional debris. Mad Max: Fury Road (2015), "Tanker"
There are many explosions in George Miller's Mad Max: Fury Road, but none crescendos with more bombast than the tanker blast at the end of the movie. An enormous and complicated practical explosion this even more remarkable given that it remains fully in-tact in the final film -- only extra vehicles, a foreground Tom Hardy on a pole and some surrounding hills were added in with visual effects. 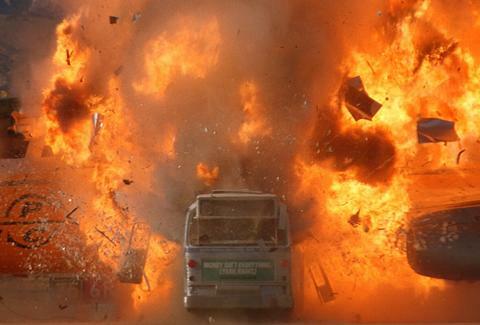 The powerful blast, orchestrated by veterans Andy Williams (Black Hawk Down), Dan Oliver (The Matrix Revolutions), and their effects team, took place during filming in the Namibian desert, where a remote controlled tractor-trailer was driven along at 50 mph. Reading like a list of ingredients for a cake, the explosion was made up of 1360 litres of fuel, 96 detonators, 280 meters of primer cord, five kilograms of black powder, and two kilograms of flash powder. It took three days to set up the effect. 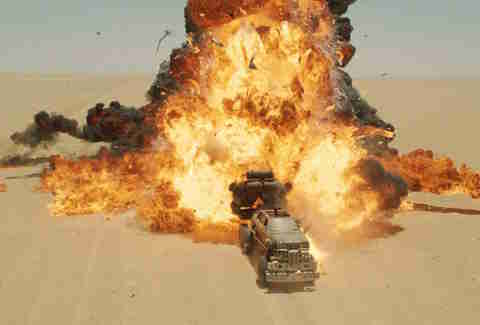 Once the Mad Max team shot the tanker explosion, a surrounding set of cars and vehicles was driven through the same area and composited into the scene. 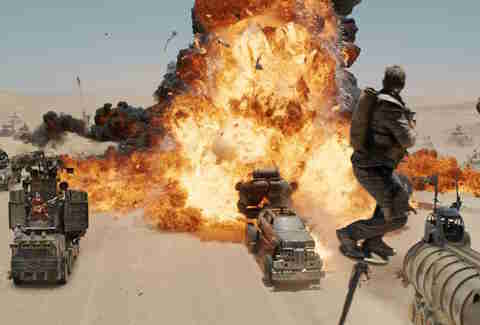 That approach was replicated throughout Fury Road; Miller shot as many of the stunts on set as possible, then used special effects to layer in even more hysteria. The Dark Knight Rises (2012), "Football stadium"
Bane's (Tom Hardy) evil plans become terrifyingly clear when the masked villain detonates a bomb in the middle of a football game, to the horror of both the crowd and the movie audience. Stunts, practical special effects and some intricate digital detail made the sequence possible. During filming, which took place at Heinz Field in Pittsburgh, the filmmakers crafted a raised section of field with various holes for stuntmen to drop into. Special effects supervisor Chris Corbould (Casino Royale, Star Wars: The Force Awakens) then set off a series of explosions that looked like dirt-filled charges emanating from the ground. Over 11,000 extras in the stadium provided real screams behind the filmed action. With that practical footage in hand, visual effects studio Double Negative set about digitally augmenting the scene to show the devastating effects of the underground blasts. This involved replacing parts of the surface of the field as it blows up and warps, adding in more debris and chaos, and even duplicating players with digital doubles as they are consumed by the explosions. Terminator 2: Judgment Day (1991), "Nuclear nightmare"
In 1991, just as digital visual effects started to show their wares in some of the biggest film releases, director James Cameron continued to mix methods in order to fully realize his Terminator sequel, Judgment Day, and specifically, a nuclear nightmare sequence in which Sarah Connor (Linda Hamilton) dreams of the apocalypse to come. The scene starts with a mushroom cloud over Los Angeles, created by exploding a collection of discs and columns covered in Dacron fiberfill (i.e., pillow filling). To send a shockwave across the city, designers at 4-Ward Productions employed some nascent animation simulation technology on top of a traditional matte painting of L.A.. Close-ups of buildings, cars, trees and the freeway were then shot as miniatures. Buildings, in particular, were flimsily constructed so when they were hit with high speed air cannons, they appeared to be blown away by the blast. As the dream continues, Connor herself becomes part of the action, disintegrating into an ashen skeleton. The legendary Stan Winston Studio accomplished this sight gag by scanning Hamilton's body and building a matching puppet. The ashen look was then produced with tissue paper and tempera paint, with shredded napkins blown into the scene, again blasted with air mortals for the final effect. Speed (1994), "Bus versus plane"
After toughing it out on a bus that can't go below 50 miles per hour, Sandra Bullock and Keanu Reeves narrowly escape their runaway transport before it smashes into a cargo plane at LAX and goes up in flames. Astute viewers may notice that behind the action are a number of unusual background mountains. This particular explosion was not filmed at LAX, special effects coordinator John Frazier (who would later help Michael Bay create his much lauded "Bayhem" on films like Armageddon and Transformers) opting to film the dangerous stunt at a desert runway at Mojave Airport using a decommissioned cargo plane (reportedly costing $80,000). As well as the voluminous fireballs crafted by Frazier's team, the explosion featured several in-jokes. The plane's logo displays 'Pacific Courier Freight', a gag from Speed production designer Jackson De Govia, who had used that same name on a truck in Die Hard and Die Hard: With a Vengeance. Following the blast, the driver of the vehicle towing the plane makes a run for it -- that's the film's line producer Ian Bryce. Back in the day, if you caught Speed on a plane, you missed this massive moment. Possibly to calm any nervous flyers, the 'airline version' of the film removes the actual bus-hitting-plane crash and shows only the reaction of the now-safe bus passengers to a non-existent explosion. The X-Files: Fight the Future (1998), "Dallas building"
When The X-Files jumped from TV land into the feature film, it did so with a bang. One of the first sequences has FBI Special Agents Scully and Mulder investigating a bomb threat at a Dallas building. They can't stop it, and the explosive brings down the front facade of the federal office tower. Incredibly, this was a miniature effect. The result of the devastation, a large hole in the building exposing all the floors, also featured into a subsequent shot. This meant the miniature had to be built 'pre-disastered', with the broken floors and shattered windows and walls as part of the construction. The result was eerily similar to the collapse of the real-life Oklahoma City Federal Building, destroyed by Timothy McVeigh in 1995. In fact, the demolition footage from that tragedy was directly referenced by Hunter/Gratzner Industries, the company behind the build. In order to provide a convincing look for the Dallas detonation, the effects team made miniature office floors on air rams which would retract during the explosion and drop pre-made debris. Additional rubble came from air mortals and pyro cannons, while fireball mortars shot out the necessary flames. Even the finest details were considered; small pieces of office-type papers float down after the explosion which were just cut-up phone book pages. All of this was filmed against bluescreen so that it could be composited into live action footage for a wide shot of the explosion, as well as a later view of Mulder and Scully assessing the damage. 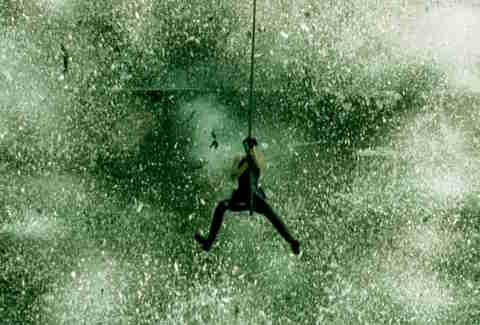 The Matrix (1999), "Helicopter rescue"
In terms of special effects, The Matrix is best known for its virtual 'bullet-time' sequences. But right after Neo (Keanu Reeves) demonstrates his powers on a roof-top, another scene with some equally impressive effects -- and one giant explosion -- takes place. 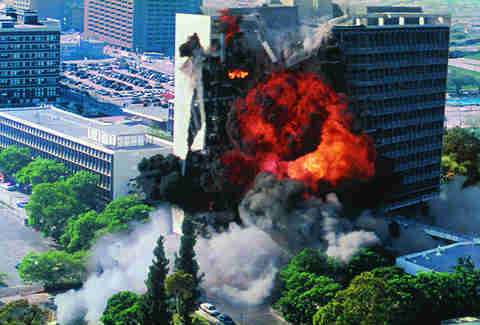 The scene sees Neo swinging Trinity (Carrie-Anne Moss) to safety as her helicopter smashes into the side of a skyscraper, sending bursts of fire and shattered glass in every direction. The scene is a remarkable combination of practical and digital effects, all planned out early using "previsualization animation," a rough approximation of the scene using stand-in CG models. The helicopter itself was a quarter-scale miniature hull that was crashed into a glass wall, wired up with a concentric ring of explosives to produce the desired blast. Depending on the angle, some of the shots required a greenscreen 98 feet high. Moss and Reeves were also captured against greenscreen, while the glass ripple was then a CG effect added later. Directors Lilly and Lana Wachowski filmed the scene at a high frame rate for maximum detail. It took 200 trial takes before the crash and explosion was shot. A back-up helicopter model was on standby, just in case that wasn't enough. Kingsman: The Secret Service (2014), "Exploding heads"
Here's a bonus: a balletic collection of 216 exploding heads is not something you might expect to see in a spy movie, but it's the centerpiece of Kingsman: The Secret Service. What might at first seem like a sequence full of horror and gore is actually the film's funniest scene, scores of villains succumbing to a chip implanted in their necks. 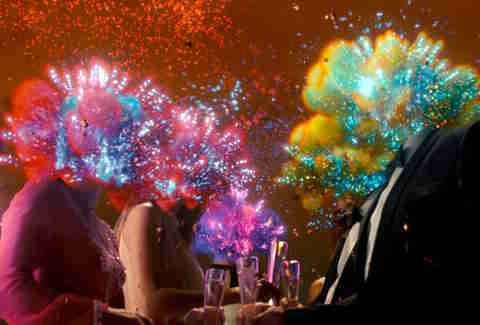 Director Matthew Vaughn turned to French visual effects studio Buf to realize the shots with rainbow-like fireworks and mushroom clouds. Since the main head splatterings all take place in under one minute, Buf quickly communicated the ridiculousness of the explosions with a four-tier effects shot: ignition, a splattering watermelon effect for the head breaking into pieces, a shockwave, a smoke cloud, and a mushroom cloud. Each element was all built inside the VFX studio's proprietary simulation software, and, once rendered, was tracked onto each villain's head. If that wasn't enough for a fantastical set of explosions, the sequence was also tightly choreographed to music, a variation of the very British 'Pomp and Circumstance' march. It ends with one final slow-mo explosion of the UK Prime Minister's head, complete with liquid blood trails (in multiple colors) ensuring the audience gets an in-depth view of this spectacular scene. Ian Failes is a specialist visual effects and animation writer and a cool guy who doesn't look at explosions. Follow him at @vfxblog.